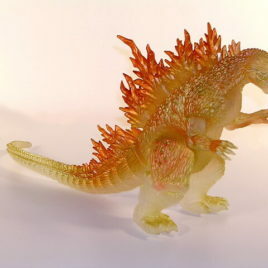 Exquisitely crafted King Ghidorah aka King Ghidra Netsuke or toggle produced by chara-ani company of Japan for the release of the latest Godzilla movie by Toho, Shin Godzilla. These amazing figures were initially sold only in certain of the movie theaters showing Shin Godzilla in Japan. These netsuke stand about 3 inches tall and are made of some type of compound that mimics wood. The Netsuke comes in its own wooden box with strap to attach to hang from anything you choose. 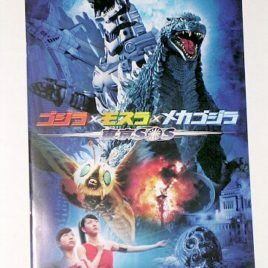 25 color pages of photos including exciting movie action, artwork and descriptions of super weapons and equipment from the 2004 movie Tokyo SOS. Includes several pages of figures and toys that were produced for the movie in Japan. MINT Condition. Scroll down to see additional photos. 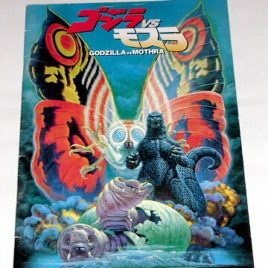 This is a colorful Japanese Movie Program from the showing of Godzilla vs. Mothra 1992. This program is in Mint Condition! It has 27 color pages with many outstanding photographs of the movie and cast. It contains many wonderful action scenes from the movie as well information about the cast ( in Japanese of course). 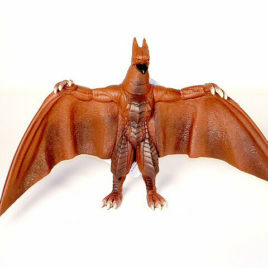 LOTS OF GREAT PHOTOS OF BATTORA Battra! !